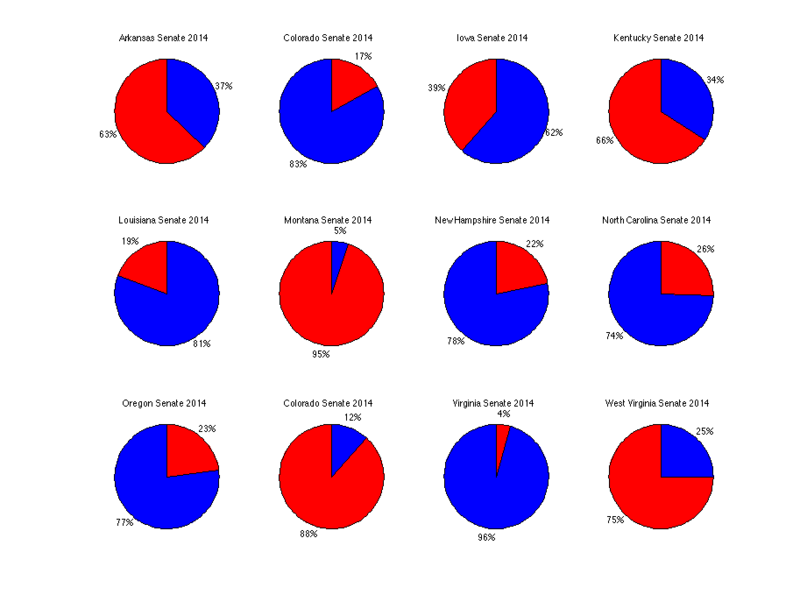 These graphs show the probability of each candidate winning the November, 2014 elections. The graphs above were generated by our stochastic calculus algorithms, in which we generate 100,000 random walks to obtain the predictions above. 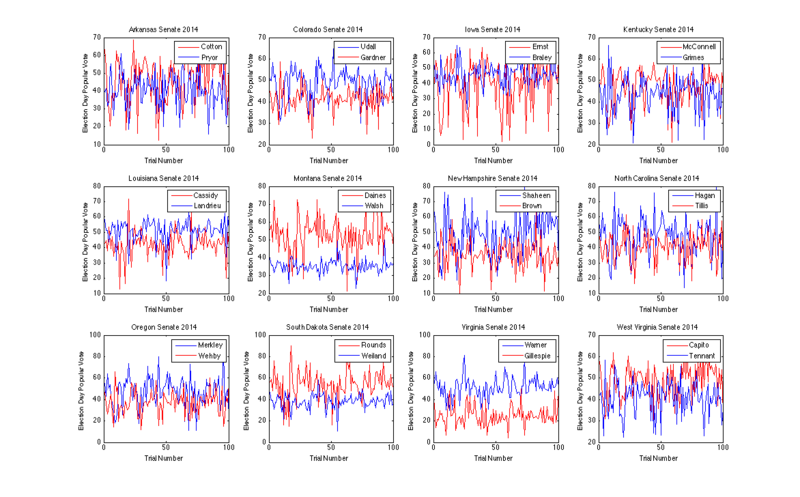 We show below the output of these random walks on election day. For brevity and clarity, we have shown the results of the first 100 random walks, but the pattern is clear. The results of our random walk experiments based on our stochastic calculus algorithms. These results show the candidate’s popular vote percentage on election day, November 4, 2014. Cotton:62.77 % chance of winning. Pryor:37.23 % chance of winning. Udall:82.87 % chance of winning. Gardner:17.13 % chance of winning. Ernst:38.5 % chance of winning. Braley:61.5 % chance of winning. McConnell:65.93 % chance of winning. Grimes:34.07 % chance of winning. Cassidy:19.29 % chance of winning. Landrieu:80.71 % chance of winning. Daines:94.93 % chance of winning. Walsh:5.07 % chance of winning. Shaheen:78.07 % chance of winning. Brown:21.93 % chance of winning. Hagan:74.2 % chance of winning. Tillis:25.8 % chance of winning. Merkley:77.01 % chance of winning. Wehby:22.99 % chance of winning. Rounds:88.4 % chance of winning. Weiland:11.6 % chance of winning. Warner:95.65 % chance of winning. Gillespie:4.35 % chance of winning. Capito:74.88 % chance of winning. Tennant:25.12 % chance of winning.